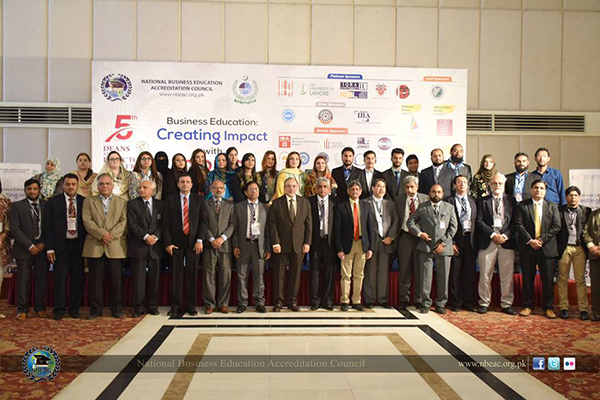 The 5th Deans and Directors Annual Conference, organized by National Business Education Accreditation Council (NBEAC) of Higher Education Commission (HEC was held, here on Monday. NBEAC chairman Dr Hasan Sohaib Murad chaired the Conference. Dr Hasan Sohaib Murad, Chairman NBEAC in his opening address, welcomed the deans and directors of business schools and highlighted the agenda of the NBEAC conference, which focused on ‘Creating Impact with CPEC.’ Dr Hasan commented that we need to maintain a balance between global paradigms and our need to customize business education in Pakistan, according to the local needs. Dr Naveda Kitchlew, Associate Dean, Academics and Internationalization, SBE, and SBE faculty members also attended the conference sessions. Muhammad Zubair, Governor Sindh was the chief guest on the occasion. He talked about the significance of CPEC in the global era, which is generating a debate as a result of changing economy and discussed how our business education can become aligned with CPEC to gain long term result. Dr Mukhtar Ahmed, Chairman HEC was the keynote speaker and stated that academic leadership has to be taken in confidence to make functional policies for socio-economic development. Notable speakers included Dr Farrukh Iqbal, Dean and Director of the Institute of Business Administration (IBA), Karachi, and Dr Ishrat Husain, Professor Emeritus, Chairman CEIF and Former Dean of IBA, Karachi. Other prominent speakers were Dr Jawad Syed, Dean, Suleman Dawood School of Business (SDSB), University of Management Sciences (LUMS), Dr Syed Kumail Abbas Rizvi, Associate Professor, Lahore School of Economics (LSE), and Dr Zaki Rashidi, Associate Dean, Management Sciences, IQRA University, Karachi. The conferences included a total of four panel discussions, plenary sessions, training sessions, workshops and seminars led by national and international trainers and speakers.